As an implant dentist, we feel that with the improvements in implant dentistry, it is only going to be a matter of time before everyone switches from their current prosthetic devices to this new and improved technology. There is really nothing new about the idea of using a surgical solution to replace lost teeth. Ever since we discovered that humankind hated the idea of losing teeth permanently, we have been searching for solutions to replace them. If you are wondering what it is about implant dentistry that will eventually cause other technology to be replaced, the answer is simple. In the evolution of prosthetic dentistry, implant dentistry has taken the next step. Doing away with things like clasps, brackets, and that messy adhesive process you use to hold your dentures and other devices in place, implants are a one-time solution that borders on permanent. When you factor in the fact that cleaning implants consist of brushing your teeth like you normally would, it becomes evident that the old ways are on their way out. No longer will you have worry about the embarrassment of forgetting your dentures or having them fall out at an inopportune moment. With a single surgical procedure, we will give you new teeth that look, feel, and act like your natural ones. While implant dentistry has made great strides in placing teeth that look and feel like natural teeth, the greatest achievement has been below the surface. Scientists and dentists discovered that using titanium had a huge advantage when making dental implants. 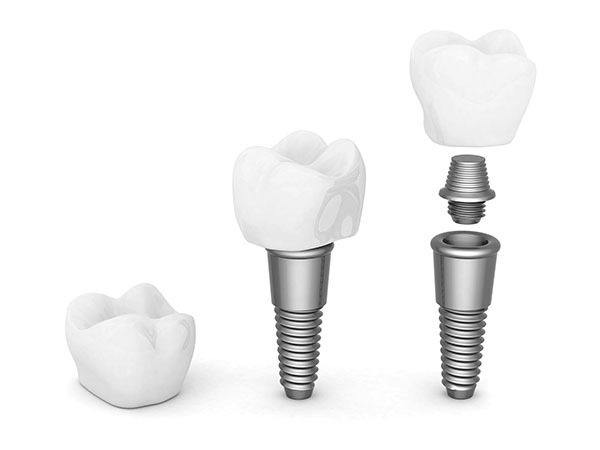 As an implant dentist, we now use titanium exclusively for the manufacture of these devices. The reason for this is that titanium has a unique property which allows it to meld with organic tissue through a process known as osseointegration. Essentially, when we install the tiny metal screw in your jawbone, the implant convinces your body that it is part of the bone. In so doing, the implant can provide critical stimulus to the jawbone. In exchange, the jawbone provides support, strengthening, and security to the implant itself. The jawbone has a very important role to play in supporting the teeth. In order for it to do this successfully the body provides vital minerals such as calcium so that the jaw remains strong and healthy. The teeth, provide stimulus to the jaw every time you bite down on something or chew food. The problem arises when you lose teeth, and the stimulus is no longer available. This sends the message to the body that the jawbone no longer is required to perform its primary functions. In response, the body starts a process known as resorption. Essentially the body withholds nutrients from the bone and leaches away those vital minerals like calcium. Left without its support system the jawbone starts to dissolve, causing the rest of your face to undergo severe changes as well. As an implant dentist, we can place titanium implants so that the body is convinced to continue or return to supporting the jawbone. This can stop the process of resorption and restore the strength of your bone.